Our first visits to our future Harlem house were conducted by flashlight because much of the building had been boarded up. It was impossible to work out what certain parts had once been like. Empty for eight years, it had previously been an SRO, a synagogue and school, and some kind of clinic. Tiny closets held unpleasant bathrooms, stuffed in after the fact. There was graffiti on the walls. The basement held two or three inches of water. The blocked drains had overflowed, ruining the ceilings. It was in many respects disgusting. But it had been built as a grand family home, and behind the iron-spot Roman brick façade lay a stack of four oval rooms. Four! One would have been exciting enough. The house had kept nearly all its original fireplaces and a great deal of its paneling and plasterwork. It had been built in 1890 by the baking-soda magnate John Dwight, co-founder of Arm & Hammer. His initials were embossed in plaster on the dining-room ceiling. 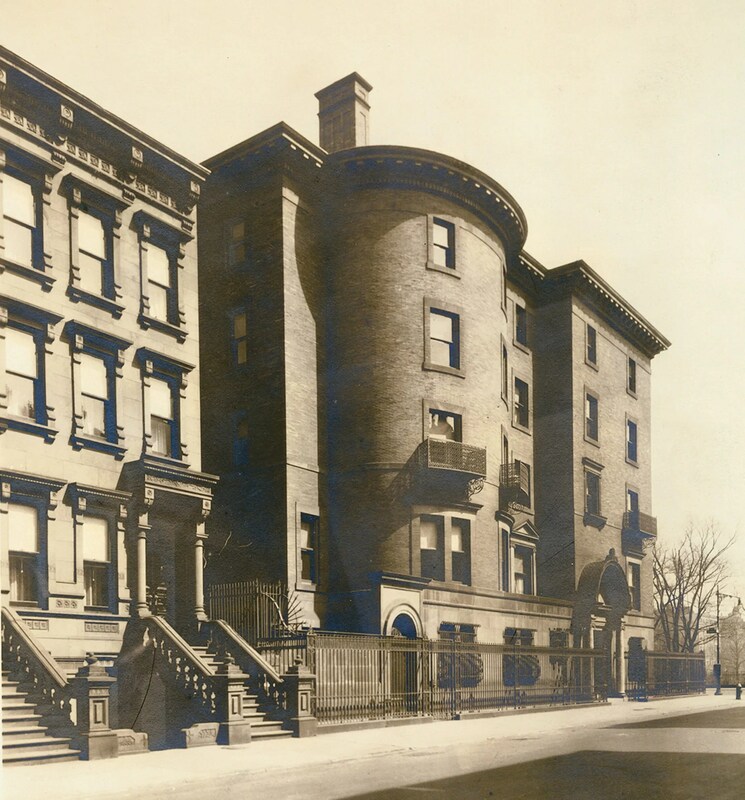 Not long after we bought the house, members of the Dwight family got in touch to say they had photographs of the building from the 1920s, made when the family had left Harlem. Would we be interested? Would we be interested! The album, together with the original blueprints, answered nearly all of our questions. Every room, except the bathrooms and the cellar, had been photographed. “It’s the Rosetta stone,” said our contractor, Mike Casey. 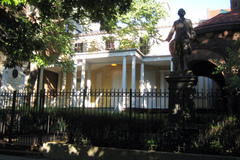 Our architect Sam White (the great-grandson of Stanford White) said he had never worked with such a well-documented house. The Rev. Peter Mushi stands outside Saint Cecilia’s Catholic church in East Harlem after Sunday mass, surrounded by a diverse crowd. The priest, who seems to know each churchgoer by name, laughs with elderly women, asks children about their schoolwork and places his hands on those who ask for a special blessing. He congratulates people on birthdays and anniversaries. Although his first language is Chaga, spoken in his native Tanzania, Mushi easily switches between English and Spanish when speaking with his parishioners. Saint Cecilia’s has more than 750 members, including Dominicans, Ecuadorians, Mexicans, Filipinos and African-Americans. Throughout its 138-year history, it has aided East Harlem’s immigrants. Today, it helps operate a food pantry, hosts Narcotics Anonymous meetings and supports the Momentum Project, providing meals for people with HIV/AIDS. But the church is in desperate need of repair. Its ceiling and walls are dotted with patches and re-patches. Water has crept down into the sanctuary and damaged a mural. Outside, the gutters are rusted and leaky, and the asphalt roof, installed over the church’s original tin roof, has cracked and eroded. The church’s intricate exterior masonry, including a beautiful terra-cotta relief panel of Saint Cecilia playing an organ, has weathered and weeds have begun to grow in the crevasses. Mushi has been campaigning to raise money for this project since he arrived at the parish two years ago. He points out that the two historic buildings flanking the church, the Julia del Burgos Latin Cultural Center and Cristo Rey High School, have already been restored. He’s determined to “complete” the block. Mushi explains that the original roof was made of tin, which is no longer available. It will be replaced by a tinted copper material, which will cost about $1.2 million, a daunting figure for a church more focused on serving residents rather than seeking their donations. 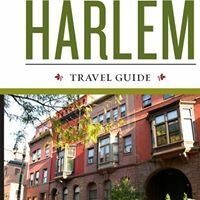 According to the New York City Department of City Planning and the 2000 U.S. Census, 38 percent of East Harlem residents live below the poverty level. Saint Cecilia’s neighbors include several housing projects and its Sunday collection never exceeds $4,000, barely enough to cover maintenance costs, Mushi explains. In fact, Saint Cecilia’s recently reduced its food pantry program due to budget cuts by Catholic Charities. Despite such financial challenges, Mushi and church members agree that restoration should be a priority. An April fundraiser raised $18,000, only enough to pay for temporary roof patches. Instead of asking parishioners for more money, Mushi has focused on getting grants. He recruited grant writer Ann Saxon-Hersh, who was impressed by the church’s historical and cultural role and describes it as “a very important cog in the wheel” of East Harlem. 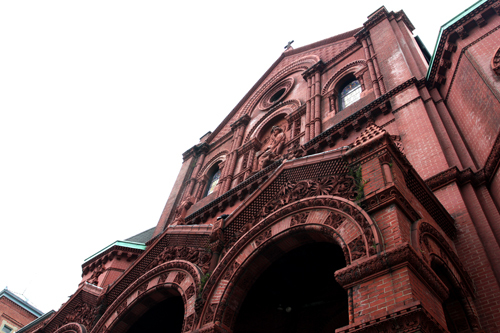 Noting the local trend towards gentrification, Saxon-Hersh hopes that a restored St. Cecilia’s will become the heart of the El Barrio Historic District. Last year, Saxon-Hersh and Mushi succeeded in winning three major grants. The largest, from the New York State Environmental Protection Fund, was for $200,000. Two others, totaling $80,000, came from the New York Landmarks Conservancy. However, the state grant is a matching grant; to receive the $200,000, the church must first raise that amount from within its community. And to begin repairs next summer, Saint Cecilia’s must somehow come up with the money by May. “This is the biggest challenge,” says Mushi. Trying to think creatively, Mushi plans to collect cell phones and printer cartridges to re-sell to a recycling center. If he collects 75,000 phones, he will raise $225, 000 – more than enough to secure the grant. He has mobilized young parishoners, encouraging them to use social networking to spread the word. He also sought help from other New York City churches, such as Saint Phillip and Saint James in the Bronx. Collecting that many phones and cartridges will be difficult, he admits, but he is determined to accomplish his goals. “You know, problems make you think,” he says, smiling.